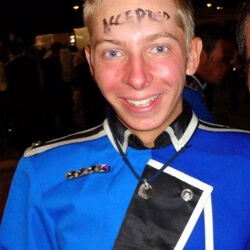 Josh Meyer, 17 Bluecoats, 1 year Trumpet 1. Choose a corps that you feel you would love performing with. I auditioned at the Bluecoats not because of placement or scores, but because I enjoyed watching what they put on the field. From the brass sound to the show design, the only thing I could think was "Wow, I want to be a part of THAT!" Find the corps that fits you. That is where you will be happiest. 2. Prepare and practice the music slowly at first. Then work it up the tempo. Don't race through fixing trouble spots or difficult passages. Always strive for quality over speed. 3. Give your all. You will be tired at some point during the audition camp. The physical conditioning block will not be easy. Do not let up. Max-out the short amount of time that you have. The staff will always be impressed by hard work and determination. 4. When it comes to the individual audition material, relax. Deep slow breaths. Remember, the staff is there to help you. You can do this! 5. Have fun! No matter what happens as far as earning a spot goes, enjoy yourself! Audition camps are a great experience. Learn from the staff and the veteran corps members, and simply enjoy playing with so many other people aspiring to be great. View additional audition tips, and learn more about corps audition dates, locations, and more.